Sara Steffens, 43, will move from Oakland to Washington, DC. 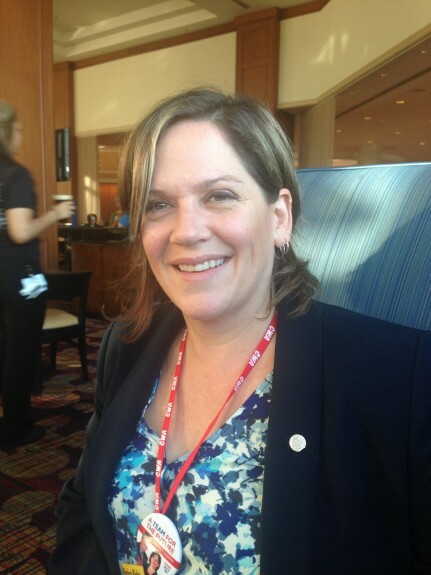 DETROIT — Former Bay Area newspaper reporter Sara Steffens was elected secretary-treasurer Monday of the Communications Workers of America, second in command at one of the biggest labor unions in the country. Steffens, 43, began her Guild activity as a reporter at the Monterey Herald and helped create the Guild’s Bay Area News Group – East Bay unit in 2008. She became a staffer and top officer in the News Guild-CWA after she lost her job in the fallout from the BANG-East Bay campaign. On Monday night, she was elevated to one of the biggest jobs in the American labor movement, defeating the incumbent, Annie Hill. 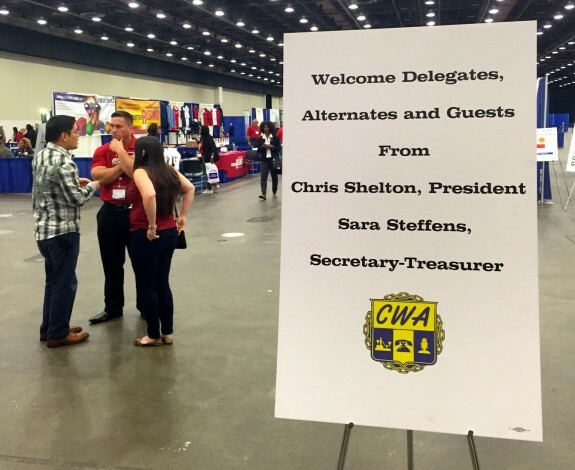 Her running mate, Chris Shelton, was elected president of the 700,000-member CWA, taking over from Larry Cohen, who announced his retirement last year. “I’m excited to get to work for our union, for our members. I’m grateful to everybody in the Guild and all the people who helped out on the campaign,” she said. Steffens becomes one of the most prominent labor leaders to have come from the ranks of journalists since the famed New York columnist Heywood Broun founded The American Newspaper Guild in 1933. In contrast to Broun’s era of labor ferment and rapid growth, Steffens takes office at a time labor has been reeling from corporate attack and political setbacks. Although no one questioned Hill’s dedication, her campaign theme of “proven leadership” proved no match against the “movement-building” promised by the Shelton-Steffens “Team for the Future.” They had the endorsement of Cohen and backing of the powerful East Coast telecommunications locals. Sara Steffens was joined by her husband, Chronicle Guild member Mike Kepka, in Detroit, where Steffens won the post of CWA Secretary-Treasurer. She was nominated from the floor by Carl Hall, executive officer of Pacific Media Workers Guild, Local 39521. “She has the experience, the skills and the persistence to get difficult and even impossible jobs done. I am deeply honored to nominate her,” he said. Steffens will serve a four-year term. She won the secret ballot election by a 56.3% to 43.7% margin. The vote count, based on membership strength represented by the delegates, was 194,461 for Steffens, 150,914 for Hill. The balloting was delayed for more than two hours Monday night by a glitch in a new vote tabulating system. Delegates waited in a long line that snaked around the perimeter of the convention center. Results were announced about 11 p.m., reaching Guild delegates during a party hosted by the Detroit Guild local at a downtown pub. 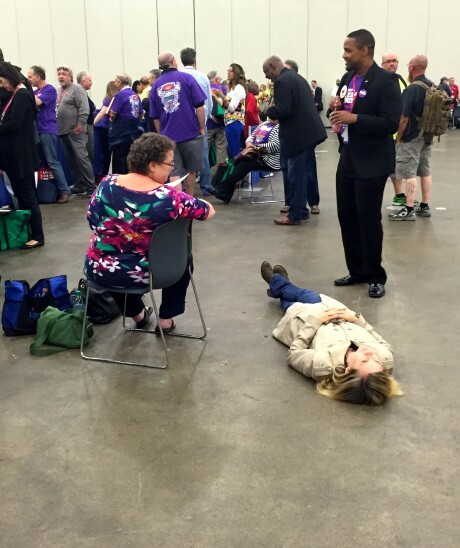 Some delegates had trouble staying on their feet during a 2-hour voting delay Monday night at the CWA Convention in Detroit. “Sara won!” declared Detroit Guild President Lou Grieco. 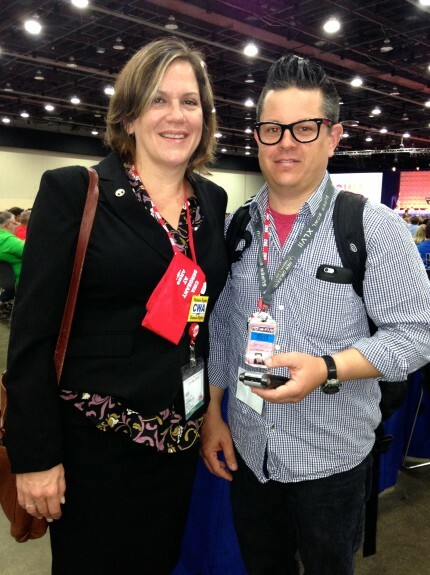 Steffens was sworn in Tuesday morning at the Cobo Center, where the CWA’s 75th Convention was held. A new welcome sign greeted CWA Convention delegates arriving Tuesday morning at the Cobo Center in Detroit. She and Shelton head a new roster of international union officers, including Tom Runnion, who was elected Vice-President of CWA’s District 9, which includes California and Hawaii, defeating incumbent Laura Reynolds in a hard-fought campaign. 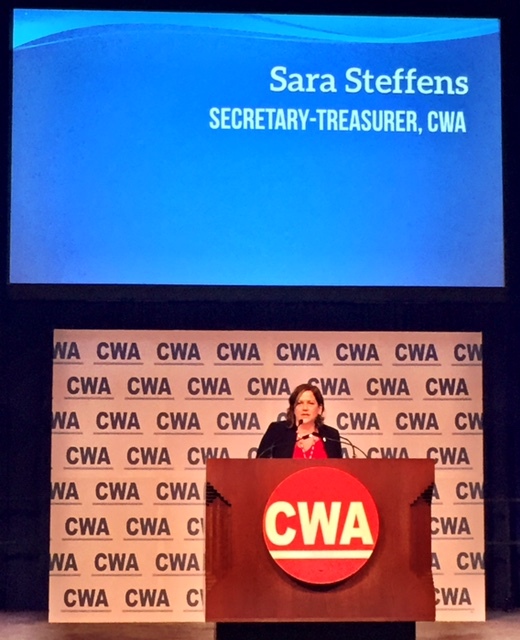 Steffens addressed the CWA Convention 75 as newly-elected Secretary-Treasurer. One of her first tasks will be relocating from Oakland to the Washington, D.C., area, with her husband, Mike Kepka, and their three young daughters Rosie, June and Grace. Kepka, a staff photographer at the San Francisco Chronicle, also is a member of Local 39521. Story and Photos by Pacific Media Workers Guild delegates to the 75th CWA Convention.